The prints of ‘Andhhagadu’ have been dispatched and everything is set for the US premieres today (1st June). The film is going to be released amid good buzz and Cineparadiso, the distributor of the film in overseas, is quite confident that the Raj Tarun starrer will turn out to be a very profitable venture. As the premieres are about to start in few more hours, the team is all excited. After the hilarious comedy entertainer, ‘Eedo Rakam Aado Rakam’, Cineparadiso is very happy to be associated with this movie, produced by AK Entertainments banner and starring Raj Tarun. The film has a crisp run-time of 2 hours 12 minutes. 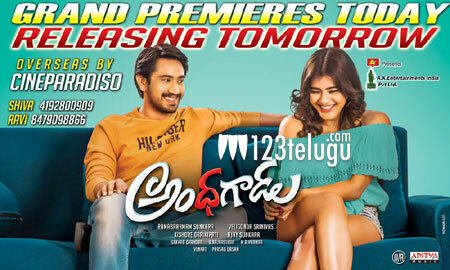 The film also marks the coming together of Raj Tarun and Hebah Patel once again after two super hits and audiences are eager to watch their chemistry unfold on screen. Hebah Patel will sure turn up the heat.Writer Veligonda Srinivas has donned the director’s hat for the first time for this movie, which is touted as a complete entertainer. The film has an interesting concept. Raj Tarun will be seen as a blind guy for 30 minutes. The title ‘Andhhagadu’ is very apt. The comedy is going to be the USP of the movie and there will be enough action, sentiment and romance.